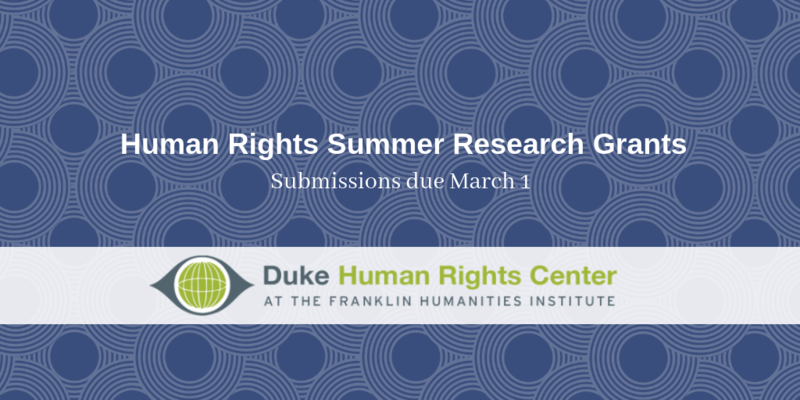 Currently enrolled Duke undergraduate and graduate students are invited to apply for summer research funding from the Duke Human Rights Center at the Franklin Humanities Institute. The goals of the grants are to strengthen research opportunities for students interested in developing, implementing and working in human rights. Special consideration is given to students whose research projects contribute to a senior thesis or project. Grants are available of up to $2,000. Students from all backgrounds and academic disciplines are encouraged to apply. Graduating seniors or graduate students in their final year at Duke are not eligible. Students must be directed by a member of the Duke University faculty and conducted over a period no less than 2 weeks during the summer. Students are expected to be in frequent contact with their advisors and the DHRC@FHI throughout the duration of the project. The grant will support domestic or international travel and living expenses, but not equipment. Projects involving interactions with human subjects, either in-person or online, may need approval from the Duke Institutional Review Board. Read more. Projects conducted internationally are subject to restrictions and guidelines for the safe conduct of research abroad. Read more. Download the application here. Send your completed application to emily.stewart@duke.edu as a word document. In addition to the application, you will need to request a letter of support from your Duke faculty mentor. This should be sent directly to emily.stewart@duke.edu. All applications and letters of support due by March 1, 2019. Read about previous grant recipients and their projects.